The main purpose of this blog is to show the delights of being an artist, helping people foster their creative artwork, and to offer tips on painting, all spiced with as much humour as can be crammed in. The reality so far, has revealed a much greater interest by readers in environmental concern for our glorious countryside, with a marvellous response to my post on Stopping Environmental Destruction on 24th May, and my letter in the national press about the appalling way the landscapes of Mid-Wales are being treated by government. 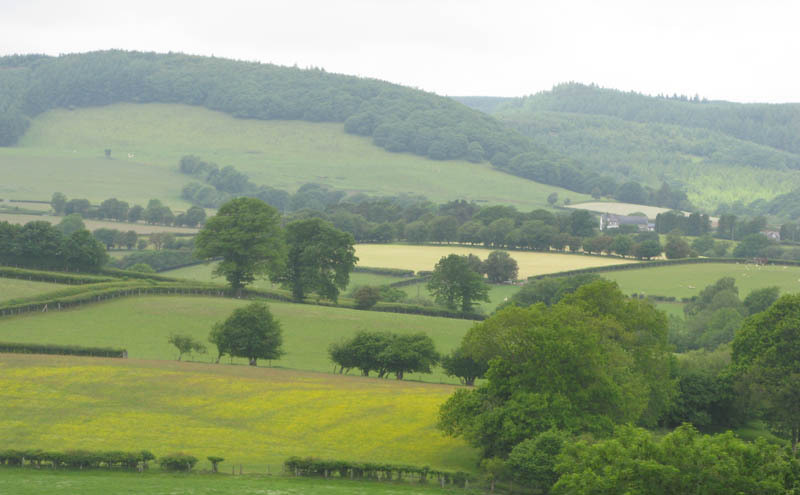 The photograph shows typical Mid-Wales rolling countryside, the sort that the authorities wish to saturate – and I mean saturate, not just one turbine here and there, not just one wind farm here and there, but obliterate much that is dear to locals and tourists alike, so that all they will see is their hills and mountains through the massive, garish prison bars of the totally out-of-scale wind turbines that are far higher, far more intrusive, and completely alien to anything else in the natural landscape. It will destroy the economy of the region and force people into poverty. This entry was posted in David Bellamy, Welsh environment countryside despoilation by David Bellamy. Bookmark the permalink.